﻿ Marcelo: "Cristiano Ronaldo has no limits"
23.09.2011 » Marcelo: "Cristiano Ronaldo has no limits"
Marcelo is one of the few Real Madrid players who certainly know how big Cristiano Ronaldo's potential is. The Brazilian player said that Cristiano Ronaldo has no limits and that he can still beat his own records from last season. It's no secret that Marcelo and Cristiano Ronaldo are really good friends, since they both play together in Real Madrid. Earlier today, the Brazilian had an interview to bwin.com, and affirmed that Cristiano Ronaldo has no limits in what concerns his football potential. Marcelo believes that CR7 can make history once more and beat his own records, set in the last season. Marcelo: "Ronaldo had a great season last year and was able to achieve an impressive record, something worthy of a true great football player. He made History on Real Madrid and I believe he has no limits regarding his potential as a player. Cristiano Ronaldo will certainly try to do even better than what he has done last season." said the Brazilian to bwin. When asked to make a preview of this Saturday's match between Real Madrid vs Rayo Vallecano, Marcelo was cautious and noted that every opponent of the Merengues are giving everything they have on the field to make them struggle as most as possible. Marcelo: "We have to play very well in order to get the 3 points. There's still many games to be played in La Liga and we have to work really hard to win it. This game against Rayo Vallecano will surely be a very tough match." As a curiosity, Marcelo also revealed that if he has the chance to score a goal in this weekend's game, he already knows to who he will dedicate it. Marcelo's son, Enzo, had his second birthday this last Friday and the Brazilian player would love to dedicate him not necessarily a goal, but preferably the victory. When asked about the competition he might face with Fábio Coentrão's arrival to the squad and regarding the left-back position, the Brazilian player preferd to focus on his virtues and the benefits he provides to the team. 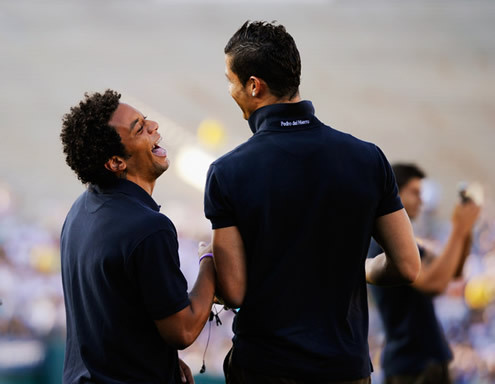 Marcelo: "I always try to bring joy and strenght to the team. This is the club where I want to play for many years to come. I want to conquer and win big titles in Real Madrid, because this is a really big club and I hope I can be here for a very long time. I always give my best, in every practice session, so that things go the way we want in matches and we manage to win those games." Real Madrid next fixture is against Rayo Vallecano, this Saturday (24-09-2011). You may watch Real Madrid vs Rayo Vallecano online, inside our Live Games Streams section. Cristiano Ronaldo will most likely be in the line-up. The countdown clock timer, displaying the time left for the next Ronaldo game, is shown on the top right corner of all pages. Don't forget that this Saturday, besides the Real Madrid game, you may also watch Stoke City vs Manchester United free live stream and Barcelona vs Atletico Madrid online streaming, in our "Live" section.